Something positive out of the Central African Republic: recently two photo-journalists rescued a large archive of photographer Samuel Fosso’s prints and negatives from looters in Bangui, the capital of the Central African Republic, which has been fractured by serious religious violence for the past few months. 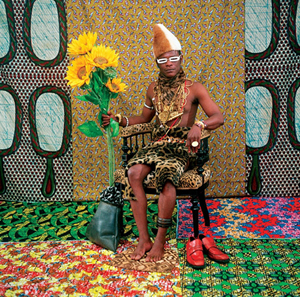 I’m been mesmerized by Fosso’s work since I came across his elaborately costumed self portraits in a book a few years ago and am glad to know his archive will not be lost. Still the situation in CAR is dire from the descriptions of the photographers who saved the prints, but hopefully with increasing international pressure a peaceful resolution might be negotiated soon.